You can tell a lot about a woman from her hair — her current mood, her morning regimen, her attention to beauty trends, and perhaps even her favorite color. And while much about our hair is determined by genetics, factors including the foods we eat, our age, and the weather around us all impact our tresses. Because strands also reveal quite a bit about a woman's health, so we talked to experts to find out what to fix — and what to be wary of. 1. Your hair is falling out. This could signal a host of things. One of the quickest causes of hair loss is not getting enough iron in your diet (anemia). Because most iron comes through meat, health coach and holistic nutritionist Kelly LeVeque recommends that vegetarians take a multivitamin. "[But] outside of diet, hair loss is most commonly related to hormone imbalance and fluctuations like polycystic ovarian syndrome, hypothyroidism, pregnancy, and menopause," she adds. "Changing or stopping birth control can cause hair loss as well." But it can also mean conditions ranging from diabetes to the flu. So if you're really losing hair, best to check with a doctor. 2. Your curls are cracking. Dry hair can mean a lot. First, you could be in an environment with extreme temperatures (or you flat-iron excessively.) So moisturize weekly, especially in winter or if you swim or dye your hair, suggests Eric Rosado, creative director at Ted Gibson Salon. "Using 6-8 drops of essential oils like geranium and rosemary is one of the best ways to add moisture." Another expert tip: Avoid products that list alcohol among the ingredients and turn on a humidifier at night to saturate your strands. This is especially true for curly-haired women, whose strands are already prone. But like hair loss, dryness could also indicate hormonal changes from birth control, pregnancy, menopause, or a thyroid condition. 3. Your bangs won't grow out. It likely means you're not getting enough protein. "Your hair is mostly made up of protein and needs it to grow," advises LeVeque. "Choose protein, vitamin, minerals, and omega 3 fatty acids that are dense in proteins to aid in the growth process. This includes egg yolks, shellfish, and wild red meat." 4. You're getting a mustache. We're talking about more than a few strands on your upper lip or chin. Polycystic ovarian syndrome has a variety of symptoms, including hair loss and pattern baldness, but one of the biggest signs is excess facial and body hair (hirsutism). Others to look out for: adult acne, or severe adolescent acne, and irregular periods. 5. Your ends are splitting. While frazzled ends could just mean it's time to hit the salon for a trim, they might signal dryness or another complication. Also, how are you detangling your hair? "Use a wide-tooth comb to detangle your hair starting from the ends of the hair up to the root," urges Rosado. This will help with split ends. 6. Your hair is falling flat. 7. Your texture is changing. 8. Your back strands are breaking. Noticing breakage at the back of your head? You may be a wild sleeper — with the wrong pillow. 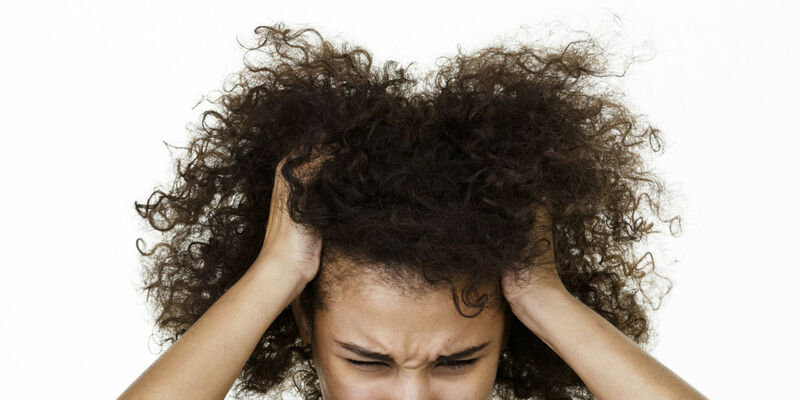 Breakage can result from the friction between your hair and a cotton pillowcase. The fix: Switch to a hair-saving silk variety instead. 9. Your color is getting lighter — and you didn't dye it. Most women don't realize that the sun bleaches and dries out the hair. "You should always use products with SPF to help protect from the sun," encourages Rosado. Eating Vitamin E-rich foods will also guard your hair from the sun's harmful rays. Inject a variety of nuts into your diet and you'll be all set. But many women also report changes in their hair's color and texture during pregnancy, too! Yes, it may just mean you're aging. But while most experts agree that going gray or white is usually influenced by genetics, many now believe that there's truth to the wives' tale about stress or trauma being a cause. Some researchers propose that hormones produced under stress can block the signal that tells the follicle to absorb melanin. The good news: Many people who say they've gone gray under pressure report that their strands have returned to normal once life settled back down. 11. Your scalp is itchy. Have you heard of sebum? It's a slippery substance formed by the glands of our hair — basically, it creates a natural conditioner for the scalp. If your sebum levels are low, your scalp will often itch. Vegetables which are high in beta carotene (beta-carotene (carrots, pumpkins, etc.) can prevent this. Surprise: It doesn't mean you have a dry scalp. Dandruff is actually caused by a yeast overgrowth on an oily scalp. "Don't over-moisturize and stop cleansing," proposes LeVeque. "Invest in the dandruff-cleansing suds and give your hair a quick post workout rinse to remove excess oils." Vitamin B6 also helps to counter dandruff. It can be found in liver and egg yolk. 13. You've got scaly patches on your hairline. Don't confuse this one with dandruff: A thick crust that forms on the scalp usually indicates psoriasis. It's the most common of all autoimmune diseases and occurs when the skin goes into overdrive, sending out faulty signals that speed up the turnover and growth of skin cells. Why look out for it? Beyond the itch factor, psoriasis often occurs along with other autoimmune diseases like Crohn's disease, lupus, and rheumatoid arthritis.